Call me crazy but I absolutely love grammar! I will diagram sentences all day! Because of my deep love for all things language arts I was thrilled that we were able to review Fix It! 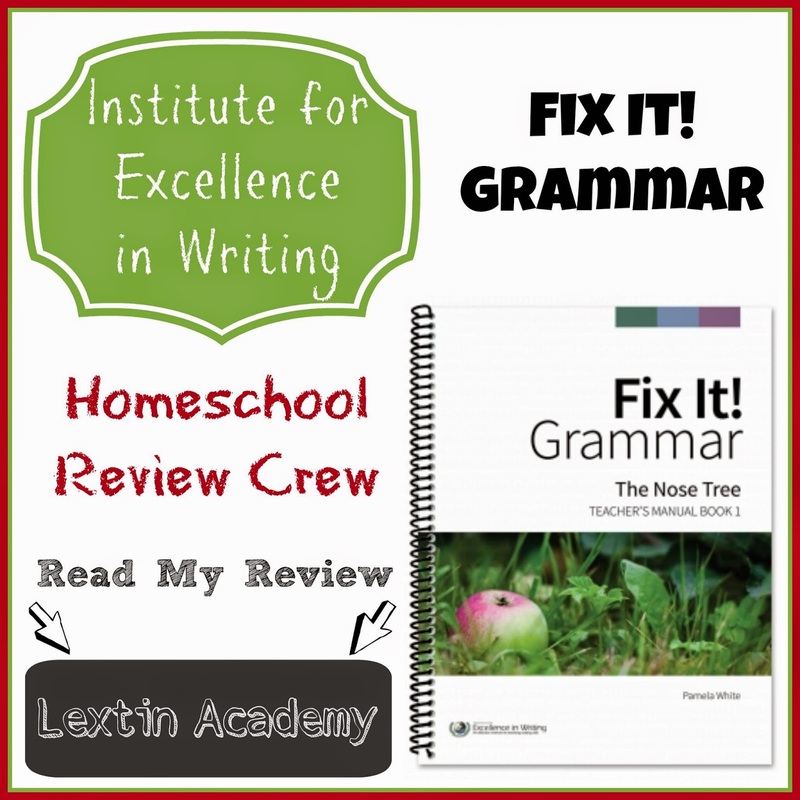 Grammar: The Nose Tree [Book 1] (Teacher’s Manual) and Student Book from Institute for Excellence in Writing. The Institute for Excellence in Writing is best known for their writing products that come with DVD training and DVD lessons for students. They also produce themed writing booklets on a variety of subjects such as fairtytales or historical time periods. Some of their newer products are a reading program for younger students (Primary Arts of Language) and also their Fix It! Grammar Program. Fix It! Grammar: The Nose Tree [Book 1] (Teacher’s Manual) and accompanying Student Book are the first in a series of grammar curriculum. Each level slowly tells a story throughout as the student practices grammar skills on one sentence per day for four days of work. These lessons should only take about 15 minutes per day. There is a new lesson every week that introduces a new concept, then the student analyzes one sentence daily, writing out each sentence as copywork until the story is finished at the end of the book for a total of 33 weeks of instruction. The Teacher’s Manual contains a glossary of grammar terms with detailed explanation and teaching. 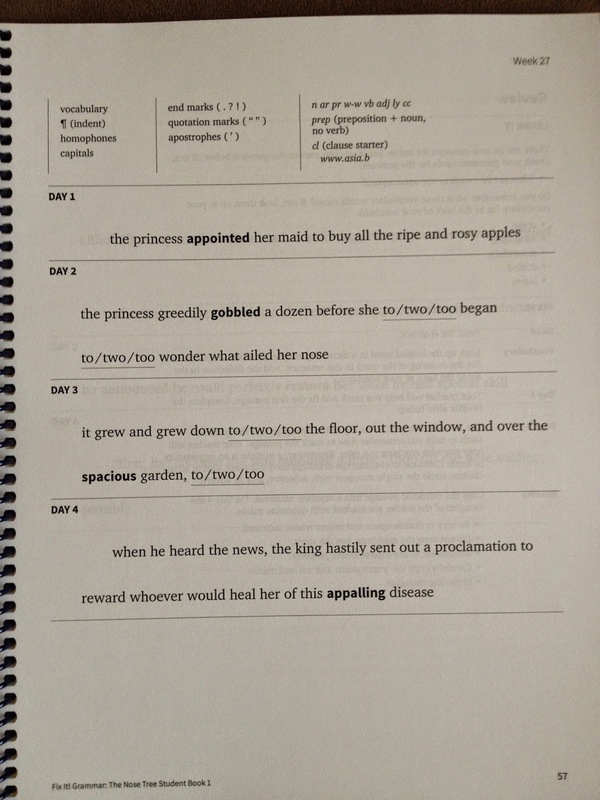 The Student Book contains all the sentences for the story, grammar review cards, as well as the glossary. This level is for children in about 3rd or 4th grade, those who need grammar review, or those who have not had much grammar teaching previously. It is recommended to start at Book 1 when beginning the program to lay a foundation in grammar concepts. 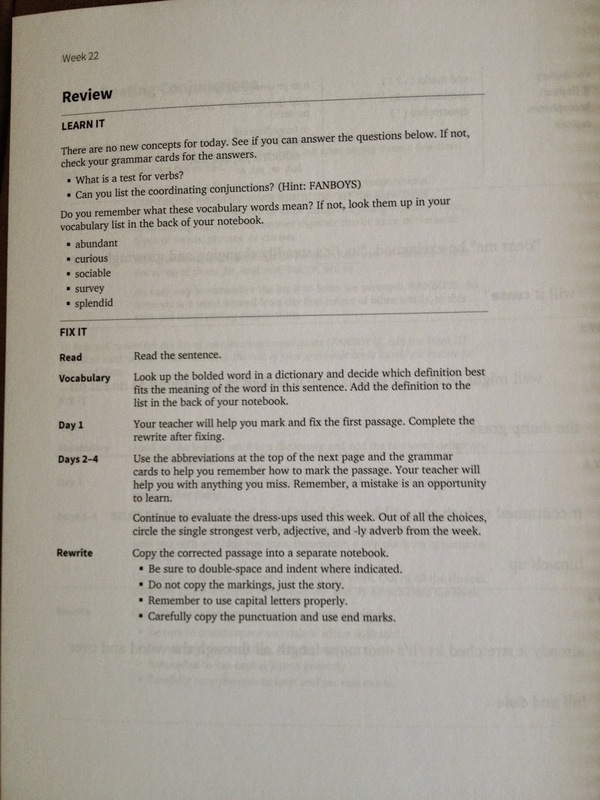 The Teacher’s Manual contains some advanced teaching concepts in each lesson and those can be used with an older student who is using this level for more of a review. If you’re unsure which level to choose, try the helpful placement test. Even though Curly has had quite a bit of grammar practice (because she’s *my* child and loves language arts as well! ), I felt that she would benefit from the review in this book as there were several new concepts taught toward the end of the book. We started using the program only 4 days per week as it is laid out but we soon picked up the pace to do more. We started doing the program 5 days per week and moving through the lessons more quickly. On a few days we even covered more than 1 lesson per week if she was understanding a concept well. On the first day of the lesson I would go over the new concept with her and we would talk about the new part of speech or grammar rule. Then I would walk her through analyzing the sentence for day one. First we looked at the bolded vocabulary word and discussed the meaning. Then we began to analyze the sentence for nouns, articles, pronouns, adjectives, etc. We talked about each part of speech or concept as she marked the sentence in her student book. At the end of the lesson, she carefully copied the new sentence on notebook paper, watching the story take shape in her notebook. 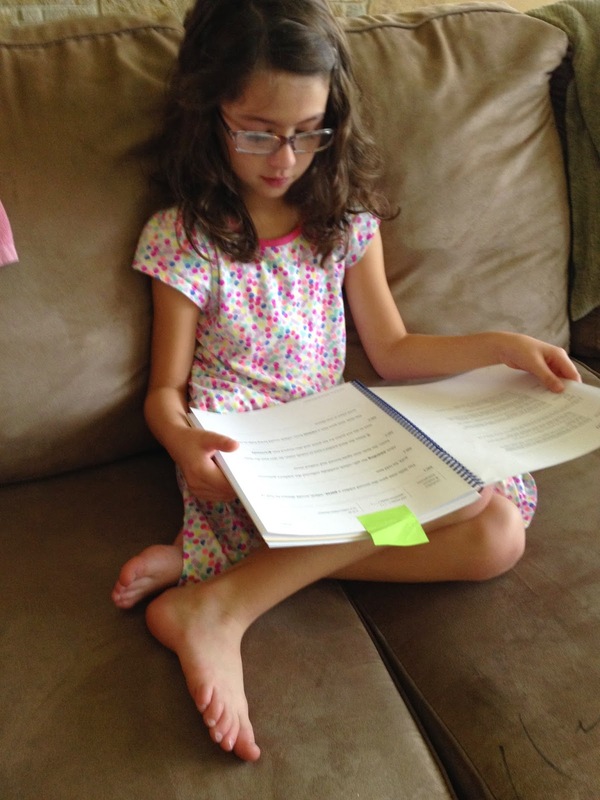 I often had to stop her from reading ahead in the story, encouraging her to save the new sentences for later lessons. The lessons are very short which is a huge plus if your child is not a fan of grammar. Thankfully Curly and I both enjoy grammar but we did enjoy the short lessons. The lessons were straight to the point and took very little time to complete. The story was our favorite aspect of the program. Each day we would read our new sentence to find out what was happening next in the story. This was very motivating for both of us and it did encourage us to work on grammar more than 4 days per week because we wanted to keep going in the story. I love that there is a vocabulary word each day. The program covers more than just simple grammar concepts – it introduces vocabulary. The Teacher’s Manual contained a definition that I could use to discuss with Curly. Each day I would ask her to try to guess the meaning of the word based on the context of the story. I found the teaching in the Teacher’s Manual to be very clear and straightforward. This program didn’t take any planning or prep on my part. Each day I opened to the lesson and was able to review the concepts quickly. Then Curly worked through her sentence, marking nouns, articles, or adjectives as I followed along on the marked sentence in the Teacher’s Manual. It is a gentle introduction to grammar with the short lessons and one new concept taught weekly. It doesn’t contain any sentence diagramming. With only one sentence to mark per day, the student might not get enough practice on some of the more complicated concepts. However, we found that it was adequate for Curly’s understanding. So, I felt it was efficient and didn’t waste our time with unnecessary busy work and practice. In addition, there are multiple review lessons throughout the book for additional practice. I loved that at the end of each lesson, Curly was instructed to write out the sentence herself. This was a great way to reinforce spelling and grammar concepts as she made sure to have correct spelling and punctuation in her copied sentences. I am a big fan of copy work to reinforce learning! 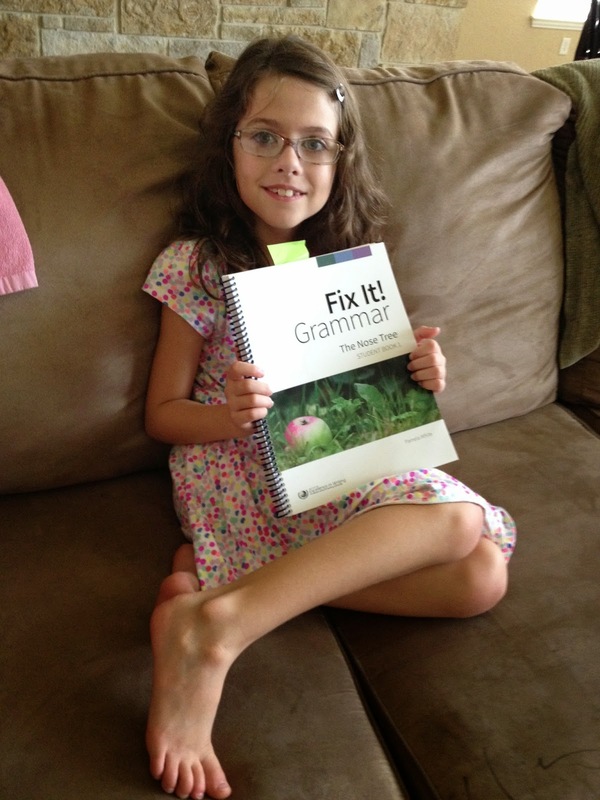 This is a fun and painless grammar program! It contains excellent instructions for the teacher with all the answers included. The lessons are very short as the student only analyzes one sentence per day. In addition, Curly looked forward to reading more of the story and finding out how it ended. This kept her excited about grammar time because it was a quick lesson that was gradually telling us a story. It’s such a fun concept for learning grammar! The Teacher’s Manual is sold for $19 and the Student Book can be purchased for $15. The student book can also be downloaded with the purchase of the Teacher’s Manual.